It was absolutely calm at Los Lances beach a very rare occurrance as Tarifa is supposed to be the 'wind' capital of Europe. The light was again fantastic, the sea was flat calm and hundreds of birds were feeding on the sand. Our first sightings were of larks and buntings, we saw large flocks of Calandra Larks and Corn Buntings just after we left the bus, they were distant but scope-able even though we faced the rising sun. A small group of Short-toed Larks flew over us and several Crested Larks fed on the track. From the boardwalk we scanned the beach and shoreline making sightings of several wader species as well as Audouin's, Yellow-legged, Black-headed and Lesser Black-backed Gulls. The prized waders were a Red Knot (still in summer plummage), Oystercatcher, Bar-tailed Godwit and there was hundreds of Sanderling, Dunlin, Ringed Plover and a few of Curlew Sandpiper, Ruddy Turnstone, Little Stint, a single Whimbrel and likewise Common Sandpiper. We walked the entire length of the beach and finished in the car park, just before the car park we climbed up the sand dunes to view the beach where many waders were feeding. From our strategic vantage point we could see out to sea where Cory's and Balearic Shearwaters fed and Northern Gannets drifted by, we also logged Sandwich Terns. The beach held good numbers of Sanderling, Dunlin and Ringed Plover whilst singles of both Yellow & White Wagtails fed near a pool. from there we drove to a supermarket to collect our picnic supplies before driving to the Ojen valley. 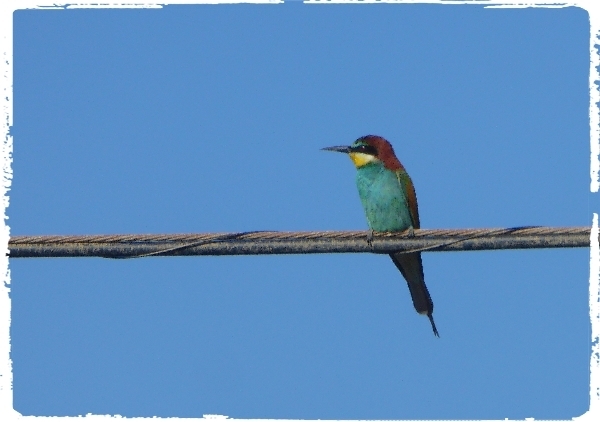 We noted several European Bee-eaters along the power lines as well as lots of Stonechats. 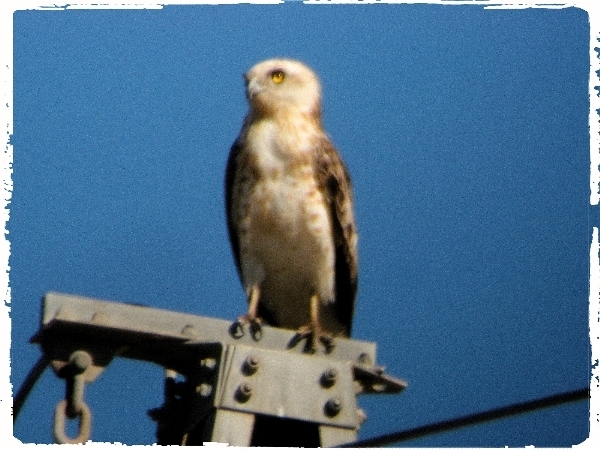 Our first walk in the valley produced sightings of Spotted & Pied Flycatcher, Common Redstart, Chaffinch and this magnificent Short-toed Eagle. We drove further into the valley and parked near a large man-made reservoir where we ate our lunch. There were very few birds around during lunch, it was the hottest part of the day, we did see some very distant Griffon Vultures, a Common Buzzard and a single Alpine Swift. After lunch we drove back to the hotel and took an hours break and by 3pm we were all assembled for our afternoon excursion.to La Janda. 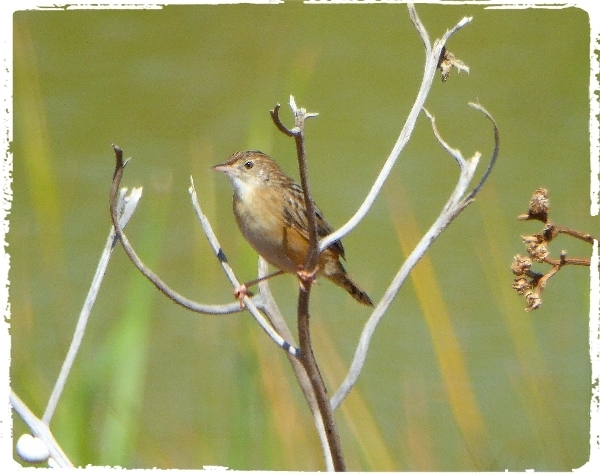 We noted many Zitting Cisticolas along the central track as well as Common Kingfisher, Green Sandpiper, Goldfinches and Greenfinches. The sun-flower harvest continued to attact huge numbers of birds, thousands of them swarmed in the open fields. Cattle Egrets and Jackdaws each numbered into the thousands and a distant 'cloud' of Wood Pigeons was the biggest flock I had ever seen there! 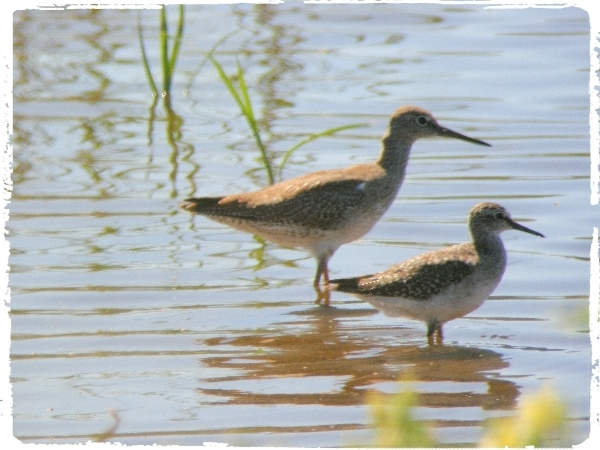 The flooded rice fields continued to attract several waders but not in any great numbers, we saw Ruff, Redshank, Wood Sandpiper, Common Snipe, Little Stint, Ringed Plover, Dunlin, Curlew Sandpiper, Black-winged Stilts and a few Yellow Wagtails. 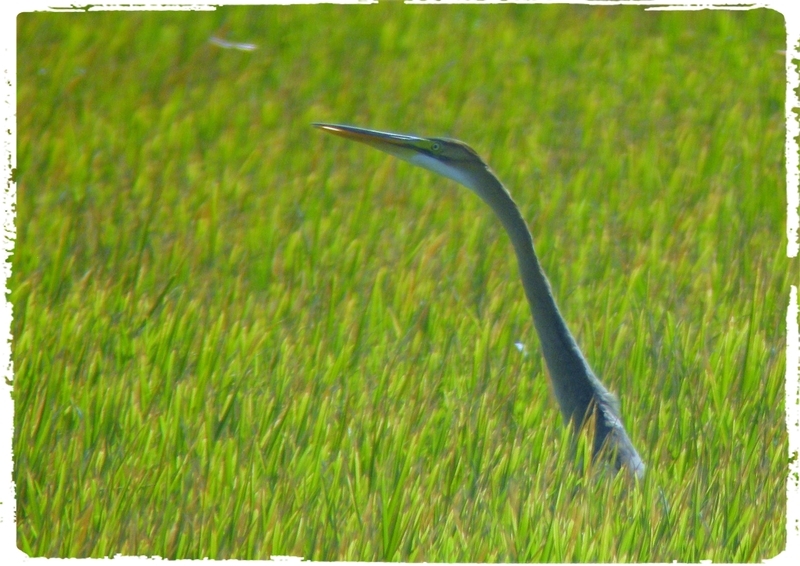 The huge numbers of Glossy Ibis and White storks continued to increase and as we continued along the track we stopped to search for Purple Heron which duly showed. 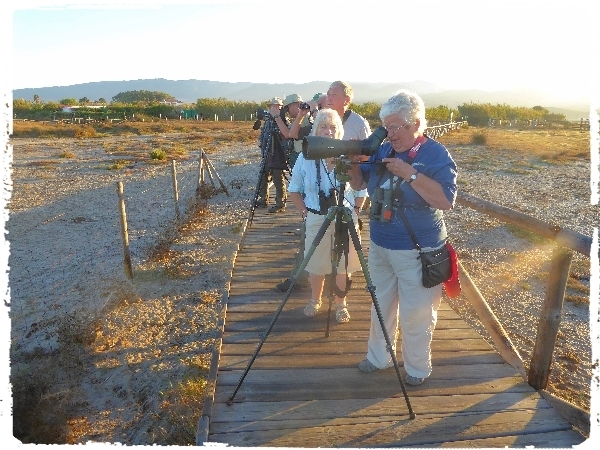 During the last section of our journey we watched a Great Egret and our first Woodchat Shrike, we picked out a few Spanish Sparrows and enjoyed watching Marsh Harriers quartering the rice fields. At 5:30pm we called time, this finished our birding for the entire trip as tomorrow we have to leave early to get to Malaga by 10am.